Welcome to the home of one of the UK’s leading audio specialists, PAS Sound Engineering. 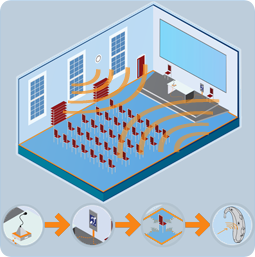 With many years of practical experience and supporting knowledge of audio induction loop systems, PAS Sound offer a comprehensive service of sales, installation and maintenance for users of assisted hearing systems throughout the UK. Serving both construction project contractors and end users direct with a specialist audio contracting service, PAS offer resources and experience which are virtually unrivalled for both induction loop systems and other commercial sound and communications systems in any environment. By engaging with PAS on your induction loop system requirement, you can be assured that you are receiving the right advice, system design and technical support. Furthermore PAS are AFILS Approved Assessors for audio frequency induction loop systems by the Institute of Sound and Communications Engineers, the UK’s leading authority on commercial audio and standards. An induction loop system allows an audio signal (such as speech or music) to be transmitted to the listeners by means of a magnetic field. This is done by varying the current flow through a wire loop in proportion to the audio signal, creating a magnetic field within the loop. A coil mounted in a hearing aid or other suitable receiver receives the magnetic field in the same way a transformer works, with the loop acting as the primary and the receiver’s coil as the secondary. The elimination of a local sound path helps to reduce the interfering effects of distance and background noise, which causes particular problems for hearing aid users. PAS Sound Engineering have been designing, installing and maintaining Induction Loop Systems for three decades and can offer you the benefits of our experience and knowledge in this specialist field. There can be many pitfalls in providing a clear, effective induction loop and at PAS we know how to avoid these and provide you with an effective solution to this requirement. Contact our sales team now – Telephone 0845 430 0546 or email us.